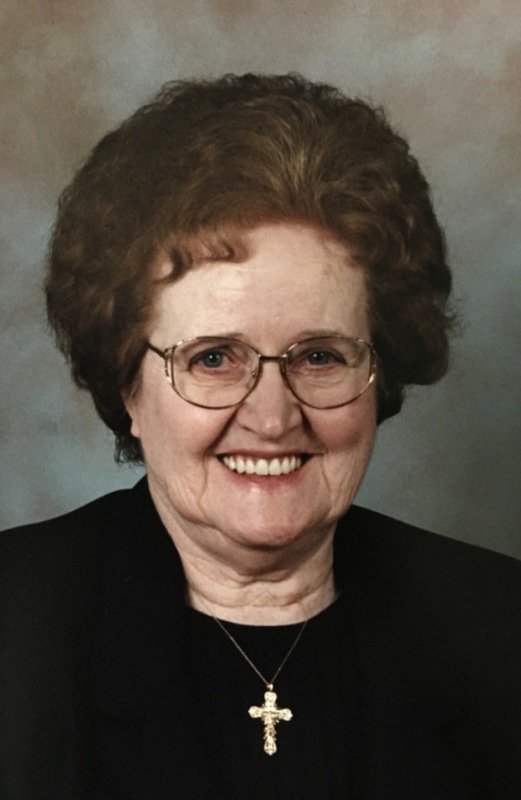 Ruth Lee (Vickers) McCullick passed away April 12, 2016. She was born August 1, 1926, to Walter Vickers & Florence (Alexander) Vickers. She married Roy Dee McCullick April 16, 1943. To this union one child was born, Roy Dee McCullick, Jr.
Roy and Ruth lived most of their married life in El Dorado Springs, MO. His job with International Shoe Company transferred them to several locations throughout the years, with Jackson, MO, being the most recent, before coming back to El Dorado Springs where he retired in 1988. No matter where they lived Ruth always made it feel like home with her hard work, skillful homemaking, delicious cooking, and loving heart. Ruth was a talented seamstress, sewing for many members of the community. Ruth also sewed many clothes for her granddaughter Marie throughout the years and made her a quilt each year on her birthday, until her eyesight would no longer let her embroidery. Ruth was an avid gardener and canned most of what she grew. She and Roy spent most weekends when the weather permitted fishing at Stockton Lake, where they kept their boat at the State Park Marina. She enjoyed country music, shopping, and a good laugh. Roy passed away August 7, 1989. Ruth continued living in El Dorado Springs until 1999 when she moved to Nebraska to live near Marie and her family. Ruth really enjoyed her great grandchildren. Ruth was preceded in death by her husband; brothers, Walter (Bud) and Robert; brother-in-law, Allen Ray McCullick; sisters-in-law, Ruth (Noyes) McCullick and Fern (McCullick) Wood; nieces, Donna Rae (McCullick) Neely and Patricia (Wood) McCowan. She is survived by her son, Roy Dee McCullick Jr, of Oxnard, CA; granddaughter, Marie McCullick, of South Sioux City, NE; great-grandchildren: Shelby Schmitt, of Bartlett, NE, Naomi Nyznyk and husband, Nykola, of Fremont, NE, and Daniel Schmitt, of Lincoln, NE; great-great-grandson, Judah Nyznyk; nieces: Jeanie (McCullick) Ogle and husband, Jim, Myrna (McCullick) Parks and husband, Dean, Betty (Wood) Fugate and husband, Don; and nephew, Kenneth Neely. Funeral services will be held on Saturday April 23, 2016 at 10:00am at Bland-Hackleman Chapel with Pastor Jack Daniel officiating. The family will receive friends before the service, beginning at 9:30. Interment will be at El Dorado Springs Cemetery under the direction of Bland-Hackleman Funeral Home. Pallbearers are Daniel Schmitt, Robert Baker, Rusty McCowan, Kyle Neely and Jim Ogle. Honorary pallbearers are Kenneth Neely, Dean Parks, Don Fugate, and Milton Odvody.